I know this is your work neighborhood. I walk by your front door pretty regularly. You and I met for coffee when the council was considering the 3' safe passing ordinance. Also, you are my councilman. Thank you for being willing to hear my suggestions. Consider how we influence human behavior in transportation as you assess crossing 41st & Kiwanis. A driver encountering an intersection operating at less than standard functionality will poke their way through the intersection as best they can. When intersections are planned to be operating at less than standard functionality we put up signs in advance with warnings and post way-finding messages. We do this because crashes happen when we don't. Somehow we don't do this for sidewalk users. Heading south or east on the sidewalk we expect users to know 660 or 1100 feet in advance that crosswalk passage through an upcoming major intersection is not available. We offer no way-finding at the point of closure and even if we did the signs would offer options that are round trips of 1/4 mile north or 1/2 mile west. This is a substantial increase in distance and time for most sidewalk users. Don't completely accept police spokesman Sam Clemens press briefing statement, "if you're going to be crossing the street make sure you do it in the marked crosswalk going corner to corner." Don't completely accept KELOLAND's interpretation of Sam Clemens statement, "Clemens said the crash occurred outside of nearby crosswalks. 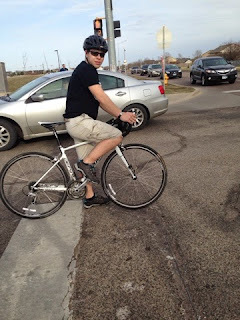 He urged bicyclists to use marked crosswalks and to make sure the roadway is clear before crossing." Because you are a city leader I suggest that it makes sense to consider all transportation system users when designing infrastructure. Most crashes happen not because people are out there doing dumb things, but because they're trying to make use of a system that isn't designed to accommodate what they're trying to do. It seems reasonable to me that a person standing on the northwest corner of any intersection in the city wanting to cross in any direction should be accommodated. The next Saturday Coffee Shop Ride is Sunday May 31. We'll depart at 9am from the Manna Bakery. The Manna Bakery address is 812 E 6th St. You were paying attention when you read that first sentence, right? It said, "The next Saturday Coffee Shop Ride is Sunday May 31." 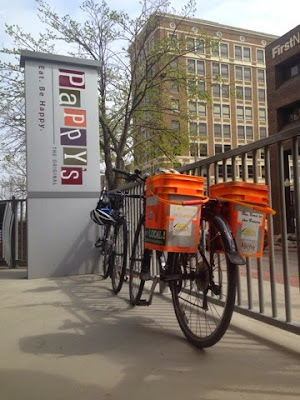 After taking this picture it quickly moved high on my list of favorite bike Sioux Falls photos. The Manna Bakery has no indoor seating so I'm hoping we're beyond the realm of snowfall by then.Also, the Manna Bakery has no indoor seating. 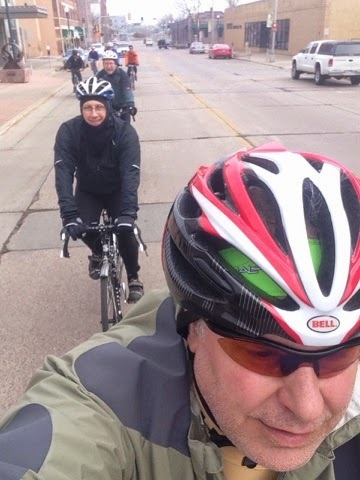 Here's the group picture from April's ride. 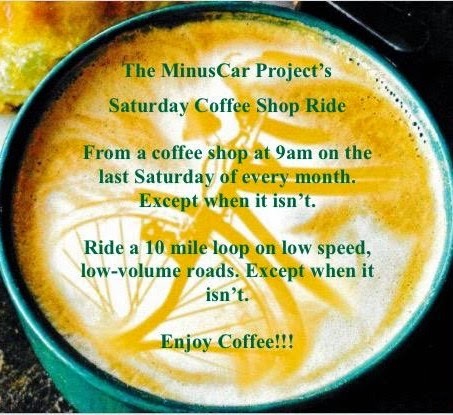 Here is a link to the general expectations of the Saturday Coffee Shop Rides. Faster riders may find the speed of this ride a bit mentally challenging. 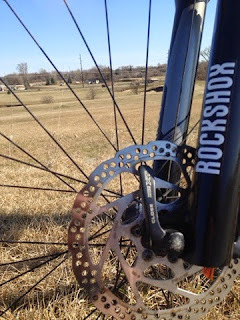 If you want to see the entirety of the Saturday Coffee Shop Rides posts follow this link. The next Saturday Coffee Shop Ride will be the last Saturday of April. The 25th. It will depart from Pappy's The Original - 101 S Phillips Ave. We'll encircle the heart of the core of the city, and take a nice long look at Covell Lake. The ride leaves at 9am. The loop again is about 11 miles and is as always weather adjustable. We'll enjoy coffee or full breakfast after. There are general expectations of the Saturday Coffee Shop Rides. Faster riders may find the slowish speed of this ride mentally taxing. Upon further review maybe it was just me who was less likely to ride. My #30daysofbiking pledge survived intact. I've rides 12 of the 12 days of April. It's time to get real again by marking mileage. I took the 30 Days of Biking pledge. I'm 5 for 5. I've been taking pictures as I go. Here are a few favorites from the week. 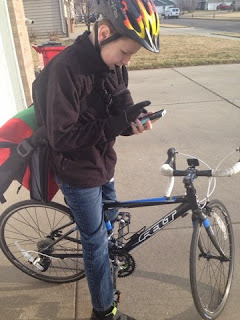 The Boy 13 before the ride to school. The Boy 17 correctly positioned and waiting for green.